Twenty-four union workers at iPhone 6 microchip-supplier NXP in the Philippines have been fired in retaliation for trying to bargain in good faith. You may want to think twice before upgrading to the newest Apple phone, unofficially dubbed the iPhone 6, rumored to be released this fall. Early peeks at the new generation of the iPhone look really cool, but there’s a dark side to what tech bloggers are calling a “bigger, faster” version of previous iPhones. Dutch electronics-maker NXP, the reported microchip supplier for the new phone, is under fire for the illegal dismissal of 24 employees in the Philippines. The workers are members of the MWAP, a Philippine metalworkers union that is affiliated with the global union IndustriALL. 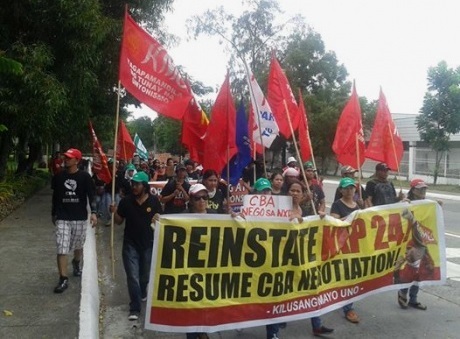 The 24 workers, which include the national MWAP union president, were fired by management on May 5 in an attempt to bust the union and quiet calls to increase low wages and regularize contract workers. NXP management charged the workers for not working four national holidays in April and May. According to their collective bargaining agreement, the company can request employees work holidays at double salary, but no request was made. NXP was cited in 2013 for illegally locking out workers at a manufacturing facility in Thailand. Apple has a similar history of abusing its workers. “If Apple does not urgently act to fix this problem… it will send the clearest signal of Apple’s attitude towards the workers in the developing world who make their products,” wrote Raina. Over 8,000 supporters have signed the online campaign run by IndustriALL, MWAP and LabourStart since the dismissals. Click here to join the fight against NXP’s union busting. Click here to visit the campaign’s Facebook page.